The list of venues keeps growing and I hope this will inspire more families to travel and not let Autism stop them. I fully believe in letting our kids get all the experiences that travel offers them. For traveling really is for everyone. As the first destination in Minnesota to become a Certified Autism Center, the certification means that visitors and families with children who have autism and other sensory disorders can enjoy the best possible experience while visiting MOA that caters to their needs. In order to earn the designation, 80 percent or more of the guest-facing staff had to complete the autism sensitivity and awareness training provided by IBCCES. 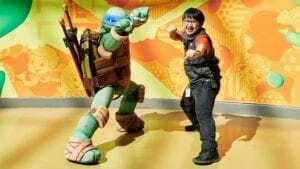 Mall of America and Nickelodeon Universe also underwent an onsite review by IBCCES, which included recommendations to make the park more accessible for visitors with sensory sensitivities, as well as sensory guides for each ride to better prepare guests on what to expect when they arrive. ALL INFORMATION SHARED FROM THE IBCCES WEBSITE. It is so great that MOA and Nickelodeon have recognized the need and taken steps to address it. Large venues like this can be overwhelming for all kids, not just those on the spectrum. The training these employees received will make all guests feel welcome and comfortable.